Competition „Luftschloss - 150 years ETH Zurich”, Switzerland, 2005. 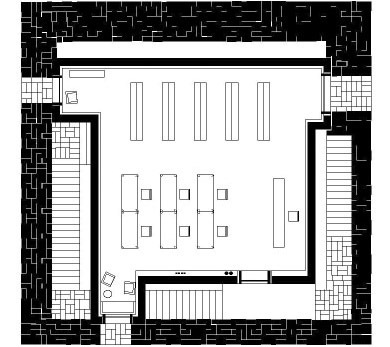 Competition Project: Students' Centre in Kandahar, Afghanistan, 1st Prize (2004). Execution in Bamiyan as ETH House of Science, Bamiyan University (2005 - 2007). Total Costs: 750 000 CHF (650 000 USD). 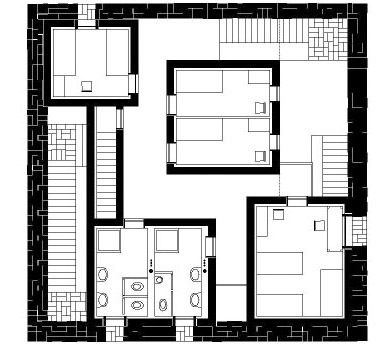 Usable Area: 650 m2. Construction Manager : Asef Alemyar, Rorschacherberg und Herat (Afghanistan). Structural Engineer: Prof. Dr. Joseph Schwartz, Zug. 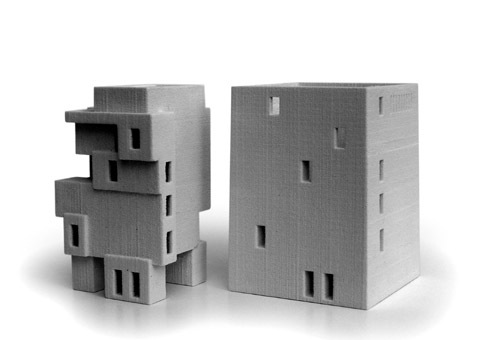 Building Physics: Prof. Dr. Bruno Keller and Stephan Rutz, ETH Zurich. With the 150th anniversary of the Swiss Federal Institute of Technology Zürich in the year 2005, a competition was advertised for the faculties of Architecture and Civil Engineering. The requirement was to design any kind of building on the terrace in front of the ETH’s main site, which would represent these two departments. The building was planned to be a temporary installation during the festive period in April/May 2005. Out of all submitted 49 projects, our proposal, code-named: „Polynational” was nominated for execution. The unusual aspect of this competition is certainly the simultaneous demands: The physical architectural project and the content, its programmatic use, were to be formulated. Our project does not transmit the meaning of architecture using a purely demonstrative object, like a festive pavilion, which tries to abstract „real“ architectural demands like utility, construction, form and present them as a model to the public. 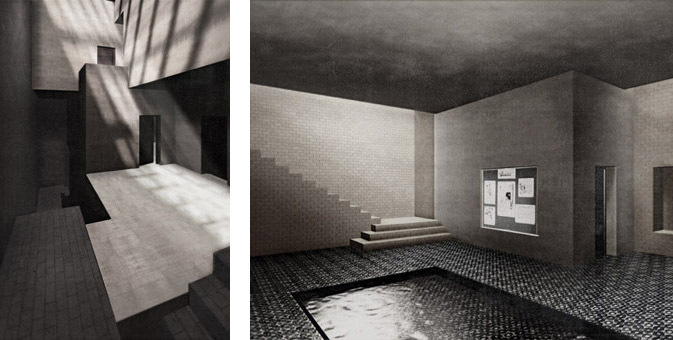 Our aim is to show architecture „in action“, acting with all the fundamental human needs. Incredibly, half a million Swiss Francs (original budget) would barely cover the costs for building and maintaining a pavilion on the ETH’s Polyterrasse. The ETH’s main building, a hallmark of the city of Zürich, is itself a „Luftschloss” (=„castle-in-the-air”). 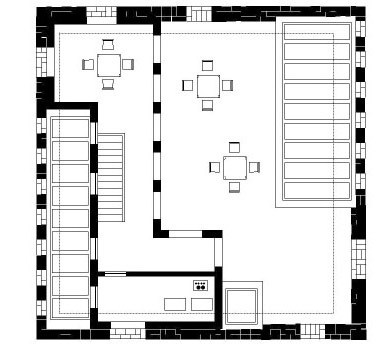 Its vast functional space provides room for an array of possible events. In a developing country, or one in the process of reconstruction, the utilisation of this sum will be multiplied by a large factor. Our suggestion was therefore to invest the money in a sustainable way in a country in development, and through that to initiate a world-wide exchange of knowledge and information with the ETH. We were planning the construction of a small building on a campus of the Bamiyan University, Afghanistan. The building will function as a platform (politically neutral and without religious affiliation) which would facilitate the exchange of knowledge between Afghan and Swiss students, and which would offer the possibility of social meeting for the students. Common projects or seminars in Afghanistan will be a plan to strive towards (a committee for the exchange was already founded, including politicians of both countries, professors of both universities and students) that is, to foster a long-term relationship between the Afghan University and the ETH. It has been so far planned that the students will develop projects for the reconstruction of parts of the city, study new technologies of building construction, hydraulic engineering to improve the local water utilities, and research on agricultural problems. ETH has the opportunity to explore the still „open“ field of architecture in Afghanistan first hand. At the same time, the advantage for Afghan University would be to have a leading consultant by its side. 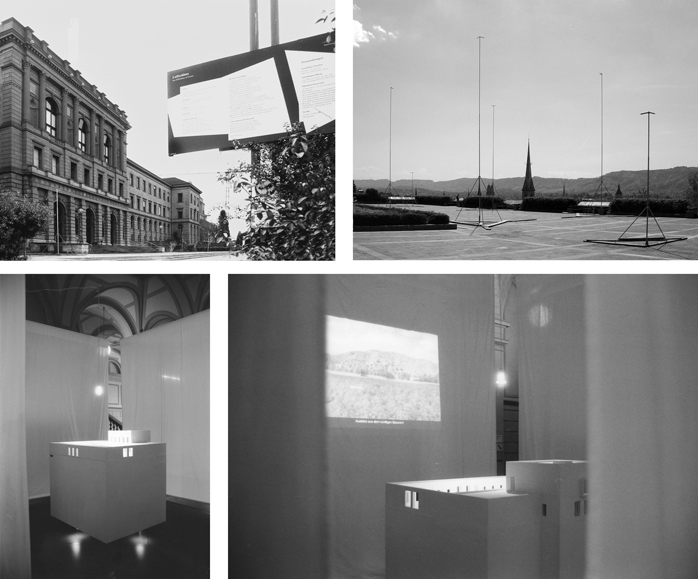 Swiss public was included in our plans: By rendering our project accessible through both an installation and exhibition our concept was communicated. The installation took place on the Polyterrasse of the ETH, in which construction posts were set up to demarcate the volume to be built in Afghanistan; a copy of the original pre-construction site. A further exhibition in the lobby of the main ETH foyer also was open to the public. Exhibition at the ETH Zurich: Information Board, Construction Posts (on the "Polyterrasse") and a Model (Vestibule). In collaboration with Bamiyan’s recently reopened university, the functional program was worked out: a large auditorium (120m2), a library with internet facilities (80m2) and a laboratory space(80m2). 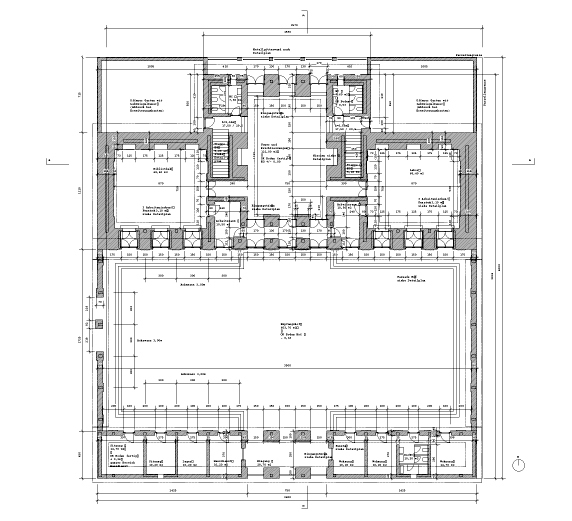 Smaller spaces are planned for security, technical facilities and micro-apartments for guests. 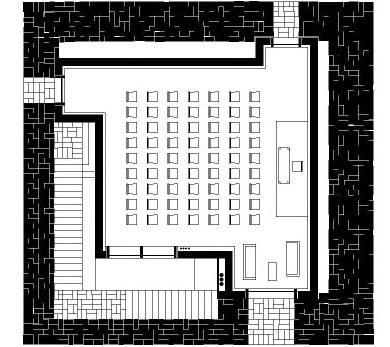 The plans supplement the University of Bamiyan’s existing buildings. They have been drawn up in such a way that the buildings will remain highly practical even if their designated use is changed. 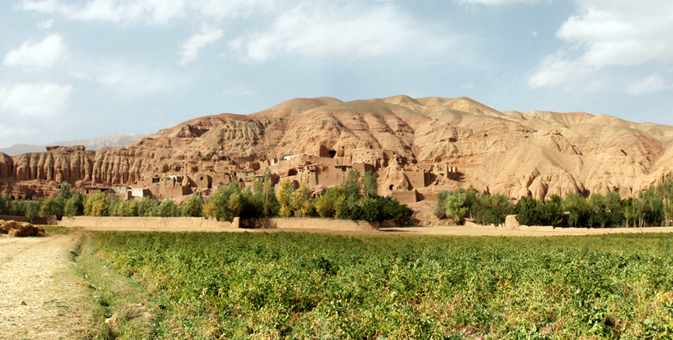 Bamiyan is situated at a high-altitude and experiences low temperatures and strong sunlight. 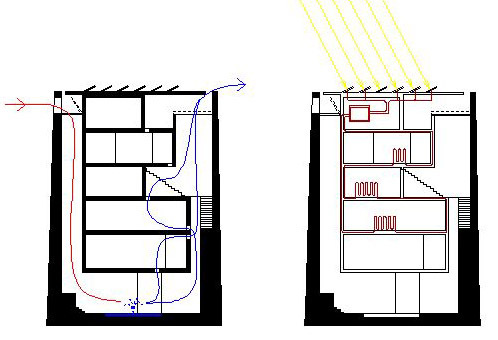 An energy concept focused on heating has been designed based on a simple spacial system. After having researched the climate and cultural traditions in the region, we have come up with a long, south-facing building fronted by an imposing reception area, a courtyard. Behind the building a garden is planned, allowing room for any future extensions. A resilient brick wall - a homogenous combination of shock-absorbing cob bricks in the core of the wall and fired bricks on the outside surface - and a temperature-regulating system of double-glazed windows (2 meters distance) are designed to produce a comfortable temperature inside the building. Apertures in the external facade are fitted with highly insulated windows that nevertheless let through maximum sunlight. These windows ensure that as much sun as possible comes into the building during the winter. In summer they are opened, though those in shade (internal windows) at the bottom of the facade are kept closed to keep out the wind and ensure that cooling energy is preserved within the building. All work was being carried out by local workers using technologies and practices that are rooted in the local culture - Only few technical equipments were imported: solar systems, windows, interior equipment like computers. The inauguration was in fall 2006, the academic use started in spring 2007. The building is situated on the new university grounds on the northern outskirts of the city of Kandahar. A mosque dating back to the Taliban regime stands to the south of the campus, integrated into the campus for university use. Directly opposite, one can find eleven completed buildings serving instructional and administrative purposes. Ours is the last building in the area, standing a few kilometres away from a rocky wall, functioning as a backdrop. Further expansion of the university grounds is planned in the area behind our building; a strategic centrality to echo its primary function as a university building. The spacial program of the new building shall be: Auditorium (100m2), Café (50m2), Working space (80m2), Micro-apartments for guests. 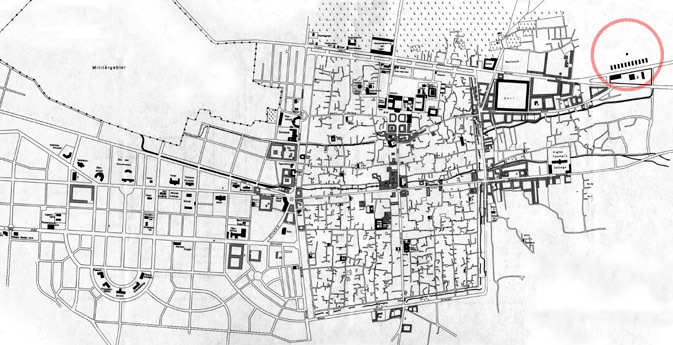 The necessary criteria for the architectonic form-finding process rely on Kandahar’s distinctive climactic circumstances. The wind blows more-or-less regularly from the southwest and with a force of ca. 3-4 metres/sec, its energy potentially useful to us. The temperature varies from ca. 0°C in the coldest season to approximately 40°C in summer. Humidity is slight, wavering between 20% and 40% on any summer day. The amount of sunlight hours is extremely high, nearing the maximum at all possible. 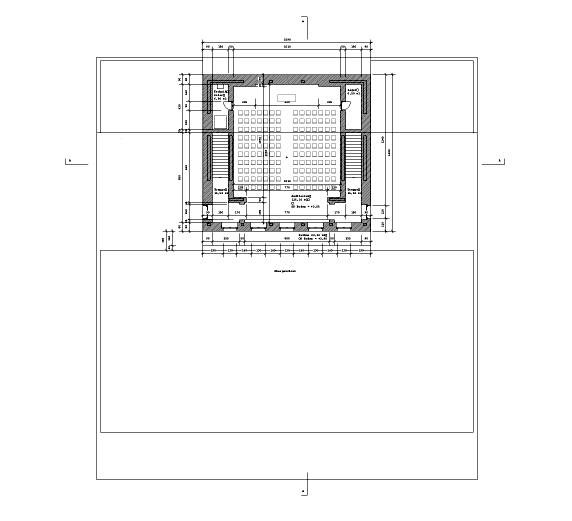 In response to these local specifications, we have developed a building which comprises of a double-shelled system: a massive and thus energy-saving („Trägheit”) clay brick mantle, and an inner-built, reinforced concrete construction, executed with ca. 30 cm-thick walls to prevent earthquake damage. 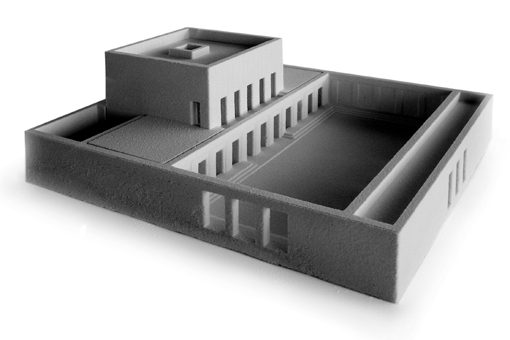 Due to its temporary use, it will be possible to isolate the building on the inside with a 10 cm-strong straw-clay layer. The building can be constructed easily with regional materials, and by local construction companies. Both „shells” (layers) are arranged together so that a space emerges, opening-up on the one hand a variety of sojourning possibilities, and on the other a climate-regulating interstice, comparable to a thermos flask. The stairway stretches along the brick wall in an upward movement, caving it in and continually ridding it of its mass. In this way the stairway narrows the wall and grants it its static sensuality. 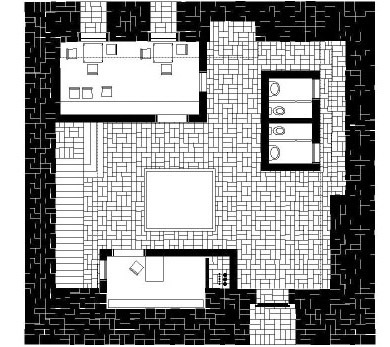 The reinforced concrete construction retreats away from the brick; the only points of contact occur where the rooms (within the construction) need windows. 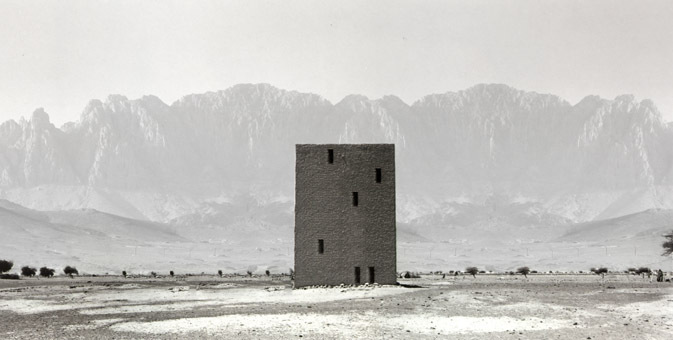 The building is positioned against the direction of the wind and catches the hot, dry desert air like a traditional windtower. In the above-mentioned interstice, the air presses downwardly and deeply, cooling itself through „evaporation-coldness” over the water basin. Following this, it can then stream upwards and distribute itself throughout the building to cool the rooms. Glass covers close the interstice, now transformed into a kind of isolation space, throughout the colder seasons. 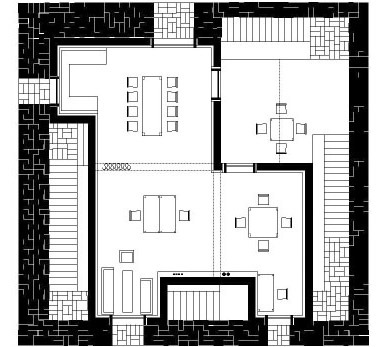 One would no longer sojourn in the ground floor foyer, but would probably prefer the residential top floor in winter. Here one can find straw mat covers and solar panels, which (due to Afghanistan’s instable electricity network) provide the building with electricity. It serves a small water pump, among its other functions. This pump heaves water from a stream into a deposit tank positioned on the roof of the building. The water is heated here through solar collectors for daily use. The building will be heated throughout the winter through the use of solar energy sources.